Published September 15, 2017, Pluto Books, UK. The crisis of the neoliberal order has resuscitated a political idea widely believed to be consigned to the dustbin of history. Brexit, the election of Donald Trump, and the neo-nationalist, anti-globalisation and anti-establishment backlash engulfing the West all involve a yearning for a relic of the past: national sovereignty. 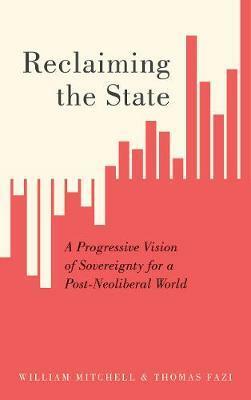 In response to these challenging times, economist William Mitchell and political theorist Thomas Fazi reconceptualise the nation state as a vehicle for progressive change. They show how despite the ravages of neoliberalism, the state still contains resources for democratic control of a nation's economy and finances. The populist turn provides an opening to develop an ambitious but feasible left political strategy. Reclaiming the Nation State offers an urgent, provocative and prescient political analysis of our current predicament, and lays out a comprehensive strategy for revitalising progressive economics in the 21st century. William Mitchell, Professor of Economics, Centre of Full Employment and Equity, University of Newcastle, Australia. 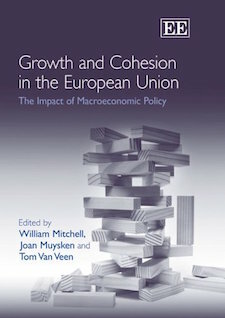 Published 2015, Edward Elgar Co.
Providing a detailed historical analysis of the evolution of the Eurozone and its failings from the 1940s to the present day, the book argues that the Eurozone lacks the necessary monetary architecture, particularly the existence of a federal fiscal function which could have resolved the economic crisis quickly. The author examines the options available to Europe and concludes that an orderly abandonment of the euro and a return to national currencies is the superior option available. The justification for this conclusion is exhaustively argued within a Modern Monetary Theory framework. 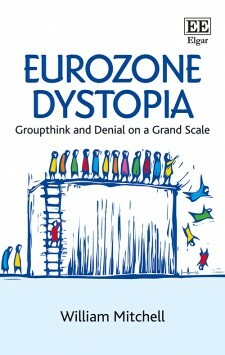 This thoughtful and accessible account of Europe’s economic woes will appeal to all those who are seeking an explanation for the crisis and are receptive to sensible and credible alternatives to the current scenario. William Mitchell, Professor of Economics, Centre of Full Employment and Equity, University of Newcastle, Australia; L. Randall Wray, Professor of Economics, Levy Institute and Bard College, USA; and Martin Watts, Professor of Economics, Centre of Full Employment and Equity, University of Newcastle, Australia. 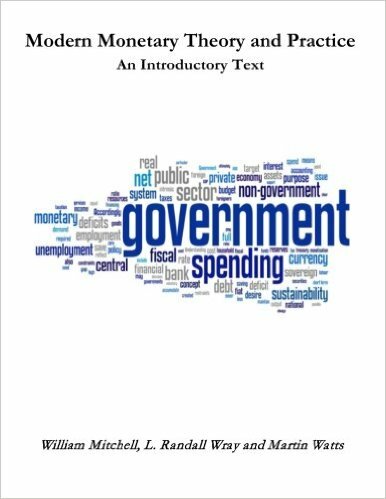 This edition contains 15 Chapters and is designed as an introductory textbook for university-level macroeconomics students. An expanded edition covering both the introductory and intermediate years of university-level macroeconomics (first and second years of study) will be published around mid-2016. It will contain an additional 10 Chapters and include more advanced material as well as the same material presented in this Introductory text. Published 2008, Edward Elgar Co. This book dismantles the arguments used by policy makers to justify the abandonment of full employment as a valid goal of national governments. 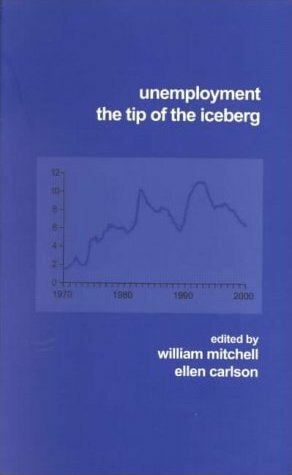 Bill Mitchell and Joan Muysken trace the theoretical analysis of the nature and causes of unemployment over the last 150 years and argue that the shift from involuntary to ‘natural rate’ conceptions of unemployment since the 1960s has driven an ideological backlash against Keynesian policy interventions. The authors contend that neo-liberal governments now consider unemployment to be an individual problem rather than a reflection of systemic policy failure and that they are content to use unemployment as a policy instrument to control inflation and coerce the unemployed with work tests and compliance programmes rather than provide sufficient employment. They present a comprehensive theoretical and empirical critique of this policy approach, with a refreshing new framework for understanding modern monetary economies. The authors show that the reinstatement of full employment with price stability is a viable policy goal that can be achieved by activist fiscal policy through the introduction of a Job Guarantee. Full Employment Abandoned will appeal to graduate and postgraduate students and researchers of economics and politics with an interest in macroeconomic policy and the labour market, particularly unemployment and neo-liberal policy frameworks. Published 2006, Edward Elgar Co. This book is a critical review of current fiscal and monetary policy in Europe and presents results of both empirical research and a discussion of the theoretical framework behind the policy of the European Central Bank and the Stability and Growth Pact. Macroeconomic policy is often hotly debated within the EU. However, the majority of policy discussions have started from a shared view of how the economy works. This shared neo-classical view is also known as the ‘Brussels–Frankfurt consensus’. According to that consensus, European labour markets are too rigid in comparison to the US labour market. Hence, the prevalent view is that the European unemployment problem can be solved by increasing incentives; improving the returns on schooling and redefining the role and the necessity of labour market institutions. In this volume the authors argue that it is not at all clear which institutions cause labour market rigidities and to what extent. They note that the problem of unemployment requires a much broader set of solutions, including active labour market policies, policies concerning schooling and the development of skills. Growth and Cohesion in the European Union also highlights that these microeconomic policies will not in themselves provide the solution to what is essentially a macroeconomic problem. First and foremost the role of aggregate demand in the determination of unemployment has to be placed at the forefront of the debate. The extensive discussion of a broad variety of topics in the field of macroeconomic policy will ensure this book finds a welcome readership amongst researchers and academics of European studies and macroeconomics. Policy advisors will also find much to engage them as the book provides a critical view on the Brussels–Frankfurt consensus, currently so dominant amongst European policymakers. William Mitchell, Professor of Economics, Centre of Full Employment and Equity, University of Newcastle, Australia and Ellen Carlson (eds). 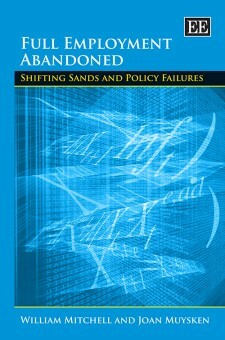 This book contains analyses showing that governments have abandoned full employment and instead use the unemployed as a buffer stock in the fight against inflation. Ellen Carlson and William Mitchell, Professor of Economics, Centre of Full Employment and Equity, University of Newcastle, Australia and Ellen Carlson (eds). Published 2002, UNSW Press, ISBN: 0733419739. Unemployment is the biggest problem facing Australian society and exacerbates most other problems. The unemployment rate has been ratcheting upwards over successive cycles in Australia since 1976. The problem is significantly worse than most people realise as the measured unemployment rate substantially understates the actual problem. Under neo-liberal policies, unemployment rates in almost all OECD economies have been rising to unacceptably high levels since the mid-1970s. The prevailing orthodoxy amongst economists and policy makers blames the persistently high unemployment on institutional arrangements in the labour market. In Australia the federal government has effectively abandoned the goal of full employment and instead appears satisfied with pursuing the diminished goal of full employability. The government is no longer committed to providing an adequate number of jobs, but focuses instead, on making individuals 'work ready', should jobs ever become available. Yet there is strong evidence that the Australian economy has been demand constrained since 1975 and simply failing to generate sufficient employment, so that active labour market programs are ineffective. There is no point in preparing the people for jobs which simply are not there. 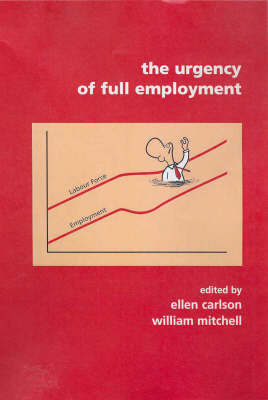 The Urgency of Full Employment contains contributions addressing these issues by leading international and Australian scholars. The well balanced mixture of theoretical and applied analysis in this book makes fundamental contributions to our understanding of the employment issue, highlighting the urgent need for a rethinking of the role of full employment on the political and economic agenda. The research will stimulate debate on the development and implementation of alternative policies to those which have failed to solve the persistent waste of our labour resources.